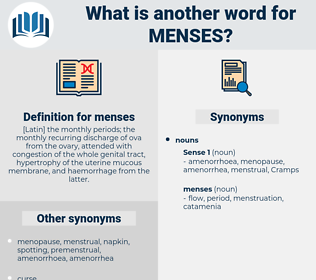 What is another word for menses? 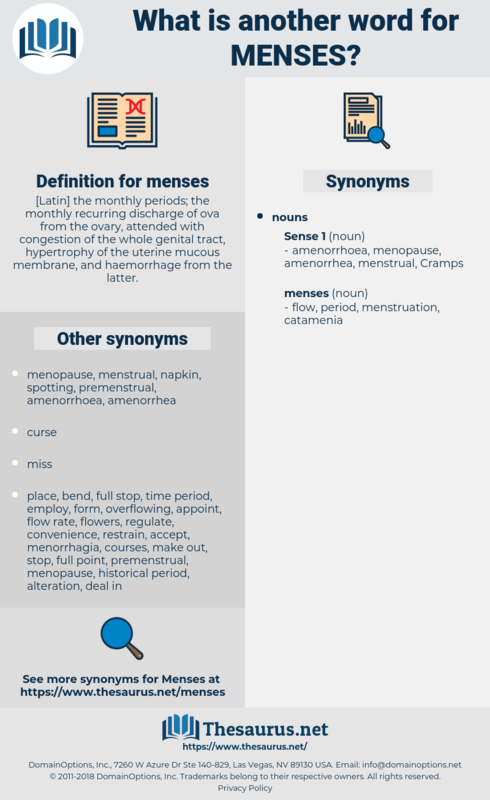 [ Latin] the monthly periods; the monthly recurring discharge of ova from the ovary, attended with congestion of the whole genital tract, hypertrophy of the uterine mucous membrane, and haemorrhage from the latter. mange, manchu, mace, Mimamsa, musa, mongoose, MCIA, mesh, manis, mg, minimise, mouse, manage, manic, mecca, masses, mews, mesua, maja, mushy, minus, myaceae, mons, maikoa, mosaic, mimosaceae, moscow, mocha, moaning, magh, make hay, managua, moksa, mangy, Manes, manque, muse, meg, mako, make way, mimosa, miosis, meiosis, meshugge, men's, muncie, mesozoic, mashi, monecious, manx, mimic, macaque, Minimus, mniaceae, mezuza, myg, mexico, musgu, Micaceous, Meno Mosso, menace, meq, mass, mock, mesa, monish, meek, max, mask, meanness, mack, muzjik, ms, macaca, mousey, massasauga, mess, mug, macao, mcg, meshugga, muck, musca, mink, mosh, moneses, maguey, meninges, momus, minos, musk, monas, meaning, missus, Monoicous, mayonnaise, mezuzah, moujik, mung, mike, muzzy, Ms., misgauge, monoecious, mix, mining, music, musky, mnemonics, make, monkish, manse, Manichee, maquis, Massawa, means, maniac, mujik, manna ash, maize, muskogee, mousy, mojo, minimize, mnemonic, meuse, moo-cow, masai, much as, musk ox, missis, mm hg, miscue, meniscus, mingy, musgoi, munich, Micheas, mash, masa, messiah, mazy, mhz, mx, mousse, mush, mosque, msc, mag, MKO, mesic, minimum wage, Micah, magic, monkey, macho, mimesis, musaceae, menziesia, MAK, msasa, msh, messuage, masseuse, man jack, mickey, mensch, mayeng, mohawk, mimus, mucus, muggee, munj, mince, manioc, minx, manioca, missy, majagua, minacious, mycosis, msg, monaco, maze, mummichog, mussy, mays, mucky, messy, ming, mick, mucous, macaw, magic eye, maxi, mac, moke, mahuang, masque, monk, mahagua, monomaniac, manus, meshugaas, mayacaceae, manky, mach, Magha, Mauna Kea, minge, magi, mucosa, mango, musk hog, message, myosis, masse, munjuk, monegasque, macau, mica, mc, momos, moss, mooch, mensa, MEK, meninx, mus, mensh, mansi, miss, moschus, mysis, much, mannish, myiasis, minsk, mossy, mashie, moses, mishegoss, mezzo, menage, muzhik, Minnie Mouse, moxie, massage, mishegaas, minkowski, muss, mongo, msec, magus, mawkish, moussaka, mayaca, munja, mucose, munch, mwanza, mangey, musquash, muggy, musci, mosey, meshuga, moose, miwok, misuse.